Carl Jung and Sting to the contrary, I don’t believe in synchronicity, but find the term a useful description of the series of happy accidents I occasionally experience. 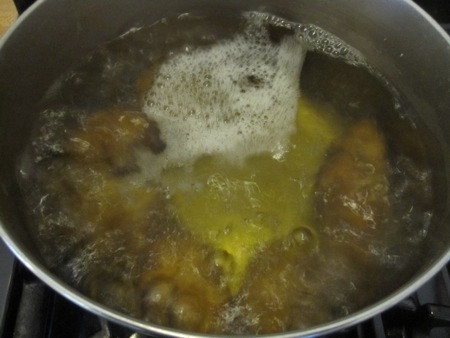 The sequence of events that led me to this recipe is just such an example: a few days after eating the potage of Jerusalem artichoke with olive oil and chives, I found Jerusalem artichokes at my farmer’s market. I wasn’t sure what I’d do with them, but I couldn’t pass them up. While consulting The Whole Beast for the pheasant and pig’s trotter pie recipe, I noticed this salad. It looked simple and well-suited as an accompaniment, but I didn’t have all of the ingredients at hand when I first baked the pie. 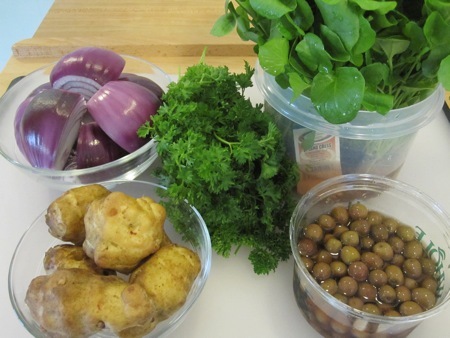 I pulled everything together a few days later: six large Jerusalem artichokes, three peeled and quartered red onions, two bunches of watercress, curly parsley, and Arbequina olives (which “give a gnya to the salad”). 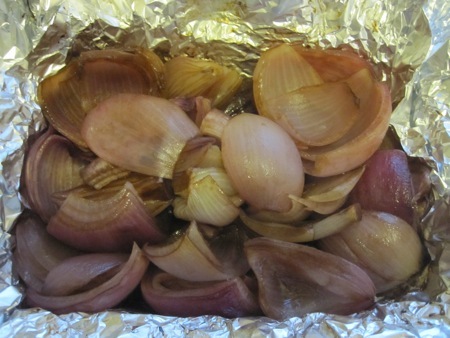 While the chokes cooked, I tossed the onions on olive oil and balsamic vinegar, wrapped them in foil, and roasted them in a 375°F oven until they were soft, about an hour. I cut the chokes lengthwise into 3/8 inch slices, then seared them on a grill pan for about three minutes per side. I trimmed the watercress above the thick stems, chopped a handful of parsley, and made a simple lemon-garlic vinaigrette. I tossed everything together with a handful of the olives and dressed the salad lightly. 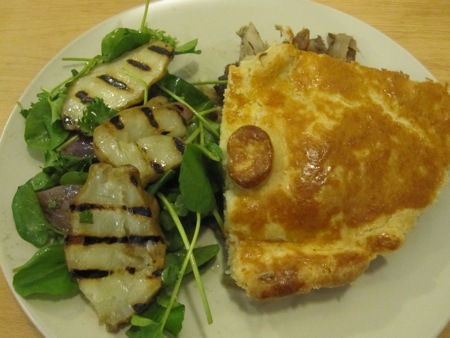 The acidity and slight bitter finish of the salad was the perfect balance to the richness of the pie. The choke slices were sweet with a bit of smokiness from the grill; I’d consider serving them that way without the accompanying greens.